MomsRising.org | Tell Congress to put an end to diaper need! Tell Congress to put an end to diaper need! The inability to access diapers can force parents to keep their children in soiled diapers (exposing them to health risks) and can prevent them from enrolling their babies in childcare. And families who experience diaper need have increased stress on employment and finances. In fact, one impact study showed that over half of parents with diaper need missed work or school because they didn’t have enough diapers when dropping their children off at childcare. That is NOT okay. Thankfully, there is help on the way. The Diaper Need Act that was introduced by US Congresswoman Barbara Lee (CA) and Congresswoman Rosa DeLauro (CT) last March, would create a $100 million program charged with distributing free diapers and diapering products (including cloth diapering supplies, diaper cream, and wipes) to neighborhoods across the nation to help reduce the diaper need among families. The bill also defines diapers as “medically necessary” so that families can purchase them through health savings accounts and HRAs. This is a huge solution to a stinky mess. 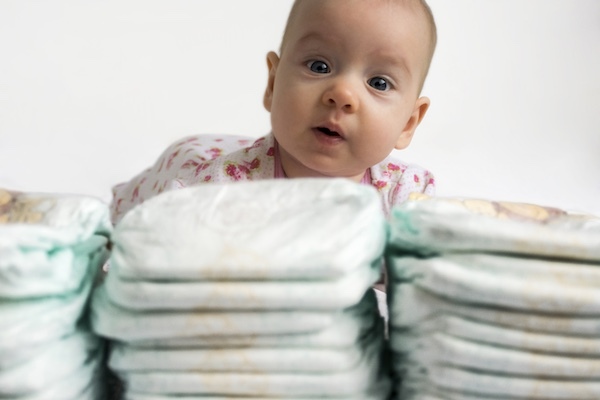 → Urge your member of Congress to co-sponsor the End Diaper Need Act of 2019 -- a bill that would make sure diapers aren’t out of reach for families in our communities and that parents don’t need to worry about keeping their children clean and healthy. Right now, 1 in 3 American families struggle to afford diapers for their babies. We need to fix this, because when families can’t afford diapers, it can put a baby’s health at risk and the negatively impact the overall financial well-being of a family. This is why I am asking for your to co-sponsor and support the Diaper Need Act of 2019 introduced by Representatives Rosa DeLauro and Barbara Lee. The inability to access diapers can force parents to keep their children in soiled diapers (exposing them to health risks) and can prevent them from enrolling their babies in childcare. And families who experience diaper need have increased stress on employment and finances. In fact, one impact study showed that over half of parents with diaper need missed work or school because they didn’t have enough diapers when dropping their children off at childcare. The Diaper Need Act that was introduced by US Congresswoman Barbara Lee (CA) and Congresswoman Rosa DeLauro (CT) will create a $100 million program charged with distributing free diapers and diapering products (including cloth diapering supplies, diaper cream, and wipes) to neighborhoods across the nation to help reduce the diaper need among families. The bill also defines diapers as “medically necessary” so that families can purchase them through health savings accounts and HRAs. Help put an end to this stinky mess by co-sponsoring the End Diaper Need Act of 2019 so diapers aren’t out of reach for families in our communities and that parents don’t need to worry about keeping their children clean and healthy.